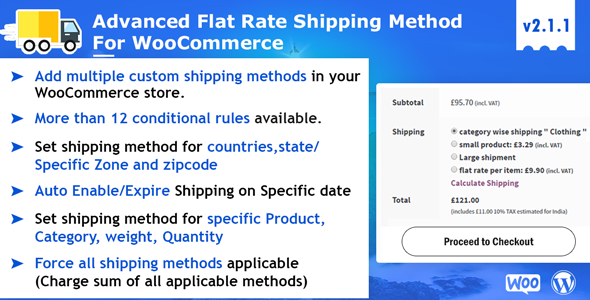 “Advance Flat Rate Shipping Method ” plugin opens the possibility to create customize shipping options. ‘Specific product’ , ‘Specific category’ , ‘Specific Tag’ ,’Specific Classes’ etc. Flat Rate Shipping Method For Countries OR Specific Zone. - Added Sorting feature Shipping Methods. - Categories list in option improved. - Increase the plugin performance.